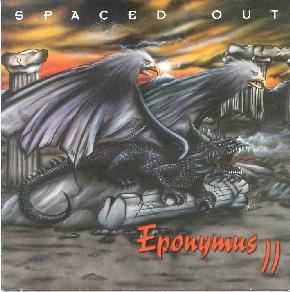 Spaced Out - "Eponymus II"
In the erstwhile days of my youth, I listened to a lot of fusion. I was totally entranced by the sheer instrumental virtuosity and speed of players like John McLaughlin, Al DiMeola, Billy Cobham, Chick Corea, Jean-Luc Ponty and others. But like a lot of those musicians, I eventually burned out on the genre. Plus, the 80's were not good to fusion. Too much lackadaisical synth playing and far too many electronic drums seemed to deaden the joyous exuberance of 70's fusion. Every once in a while though, I'll toss on an old Mahavishnu Orchestra album and relieve those glory days. I always wondered if some new band would ever have that kind of intense instrumental magic. Montreal's Spaced Out certainly comes close. The band's name is a bit of a misnomer though; they are not at all spacey. Okay, maybe they're occasionally spacey (check out the track Glassosphere Part II which has some nice atmospherics), but this band is, by and large, not about space. What they are about filling the space with complex, instrumental jazz rock. One of the things I always enjoyed about fusion was that it really allowed the bass guitar as an instrument to expand its role, often taking the lead, rather than being relegated to the rhythm section as it often was in rock music. Spaced Out is lead by bassist Antoine Fafard, who wrote almost all the songs on the album, and his bass playing is absolutely jaw dropping throughout the album, reminding one of the dexterity that Stanley Clarke displayed in the 70's with Return to Forever (I swore that Fafard's fingers were going to fall off at any moment during The Lost Train). That's not to say that the other players aren't excellent as well. Louis Côté displays some fiery chops on the guitar, and has a creative style that is quite refreshing, Martin Maheux is a capable drummer, if not quite reaching the dazzling heights some of his percussive predecessors in fusion did (although he does give quite a workout to the skins on The Alarm), and keyboardist Éric St. Jean, while usually providing atmospherics, occasionally performs some smoking synth solos and gives us a few shimmering piano breaks as well. There are few melodic hooks to speak of, which may leave some listeners feeling a little cold, but there's bristling energy to spare, and the band sounds as if they are having a helluva great time playing their music. You may just have a helluva great time listening. Spaced Out is distributed by Unicorn Records. You can visit their web site at: http://www.unicornrecords.com. Contact via snail mail c/o Unicorn Records; PO Box 95016; Lorraine, Quebec, J6Z 4P1; Canada. Hear sound sample at the Spaced Out Mp3.com web site at: http://www.mp3.com/spacedout.